It is generally held that Leod was the youngest son of Olaf the Black, one of the last norse kings of Man and the Northern Isles. Olaf died around 1237 and Leod inherited the islands of Lewis and Harris, with part of Skye. Marriage to the Norse seneschal or steward of Skye brought the family to Dunvegan, which remains the chief's seat to this day. When King Haakon of Norway was defeated at the battle of Langs in 1263, he was forced to relinquish his residual claims to the Western Isles, leaving Leod in possession of almost half of the Hebrides. 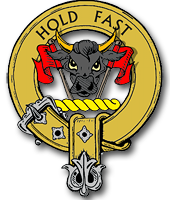 The clan consisted of two main branches, The MacLeods of Lewis, later "of the Lewes," named after a son of Leod, Thorkil (or Torquil), and the MacLeods of Skye, named after another son of Leod, Tornod, who established the seat of Dunvegan. The spirit of independence which this clan inherited from its Norse ancestors did not make them easy subjects for the crown, although Tornod's son supported Robert the Bruce in the war of independence. Historians have noted that virtually no royal charters were granted to confirm the Hebridian in their lands and titles. The MacLeods were of course, more concerned at the growing power of the MacDonalds. The MacLeods followed MacDonald, the Lord of the Isles, to the battle of Harlaw in 1411. When James IV set out to break MacDonald's power, the MacLeods were successful in steering a path through the tortuous politics of the time. However, the MacLeods, who did not owe the possession of their lands to any gift of the Stewart monarchs, were forced to accept a royal charter which did not include all that was theirs by right. 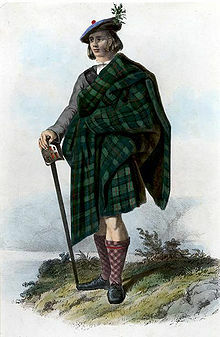 James V continued the policy of of suppressing the Hebridean chiefs, and the survival of the MacLeods is to a large degree due to the talent of the eighth chief of Dunvegan, Alasdair Crotach, "Humpbacked". Asaldair not only avoided the wrath of James at a time when many other chiefs were imprisoned or dispossessed, he actually advanced the interests of the clan. He secured title to Trottemish in 1542, which had long been disputed with the MacDonalds of Sleat. The famous Fairy Tower at Dunvegan Castle was constructed on Alasdair Crotach's orders, and he also rebuilt the church of Rodel in Harris where he was later entombed. The church and his tomb are considered two of the finest monuments in the Hebrides. He also had a flair for the dramatic, which enabled him to win a wager with James V. The chief is said to have been challenged on a visit to the royal court to admit that nothing in the isles could match the glamour maintained by the king. Alasdair replied that he had a finer table and candlesticks than any court could provide. When James came to visit Dunvegan he found that MacLeod had set out a feast on a high, flat hill known as "MacLeod's Table", facing Dunvegan, and the whole scene was lit by clansmen in all their Celtic finery, holding aloft flaming torches. The king conceded defeat! Another famous MacLeod chieftain was Ruaraich Mor (Rory Mor) who succeeded as fifteenth chief in 1595. He was knighted by James VI and continued the work of Alasdair Crotach, establishing Dunvegan as the cultural center of the Isles. He was described in a contemporary report as a "very lordy ruler". No chief of the MacLeods can avoid at least once calling Rory Mor to memory. A great drinking horn, named after Rory Mor, is kept at Dunvegan and forms an integral part of the rite of passage of every MacLeod chief. The horn holds a bottle and a half of claret, which must be drained at one draft, without setting down or falling down. Finishing this feat in under 2 minutes, the present chief has maintained the honor of his family. The most treasured relic of the clan is the Fairy Flag of Dunvegan, called in Gaelic "am BratachSith". Theories abound as to how this fragile fabric, said to have magical properties, came into the chiefs possession. It has been claimed variously to to be the robe of an early Christian saint and the war banner of King Harold Harraade of Norway, who died in 1066, but principally it is said to have been woven by fairies to be used by the chiefs in time of dire need. Belief in it's power is strong, and on at least two occasions, the magic of the flag has been called out to turn defeat into victory.